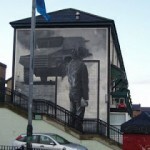 The Petrol Bomber, Battle of the Bogside Mural. This spectacular mural was painted in 1994; this mural was painted to remember the chaos and hardship that the people of this city endured. The battle of the Bogside took place on August 1969. The man wearing the mask is to acknowledge the fact that CS gas or “tear gas” was released by the RUC during this battle and so the people were forced to protect themselves hence the mask. Operation Motorman, the Summer Invasion Mural. 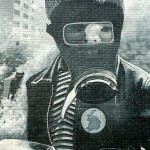 This Mural is a snapshot of the events that occurred in the early hours in July 31st 1972, this event was known Operation Motorman and it was carried out by the British Army, in Northern Ireland during the troubles. The aim of this operation was to re-claim the “no-go “areas i.e. areas that were claimed by Irish Paramilitaries these areas were established in the main towns like Derry and Belfast. This operation was to be the biggest British Military operation since the Suez Crisis of 1956; it was to be the biggest British military operation in Ireland since the Irish War of Independence. The Summer Invasion involved just over 22,000 British Troops. This mural was completed and unveiled in July 2004. The Mural has a background of squares all equal sizes this is symbolise equality, the choice of colour for each square is deliberate these are colours of Harmony and well being. The focal point of the piece is the white dove this is the eternal symbol of peace and also is derived from the oak leaf the symbol of the city and county of Derry. This Mural is dedicated to the large number of frequent riots that occurred in Derry between October 5th 1968- 15th August1969. The Civil Rights, the Beginning. 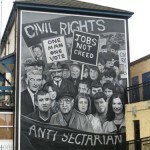 The Mural remembers the first Civil Rights March organised by NICRA (Northern Ireland Civil Rights Association) on 24th August 1968. This March Marked Derry’s beginning in its struggle for democratic rights. The March route spread from Coal Island to Dungannon in County Tyrone. 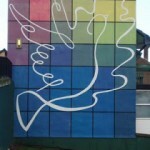 This Mural was unveiled on Friday 28th July 2006. 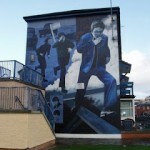 The Runner Mural illustrates a typical scene from the Bogside during the riots i.e. the CS gas in the air. On one side of the Mural are two small images of two young boys, Manus Deeney and Charles Love both who met their fate on the streets during the troubles. Manus Deeney was shot dead at 15 years of age on May 19th 1972. Charles Love died on 28th January 1990 by a bomb explosion whilst watching Bloody Sunday Commemoration March the bomb was released by the IRA it was intended to injure or kill nearby security forces. The Bloody Sunday Commemoration Mural. This mural was completed on the 27th anniversary of the shooting of the 14 victims of bloody Sunday. Bloody Sunday was the shooting and killing of 14 men on the 27th January 1972 by the British Army. On the Mural itself there are the faces of the 14 men who were murdered and beside each face is a small oak leaf symbolic of the Derry Oak. 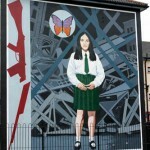 Bernadette, Battle of the Bogside Mural. 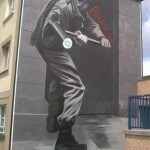 Another snapshot of the Battle of the Bogside, this mural was painted in 1996 two years after the mural mentioned above. This mural has a number of themes within it; the first is the Free Derry Gable wall which is the centre focal point in the painting. The Bin lids were used by woman and children to raise alarm to all nearby of raid by the British Army. The Final image is of Bernadette Devlin who was given a speech, addressing the crowds she was later imprisoned for her actions. The Death of Innocence Mural, Annette Mc Gavigan. 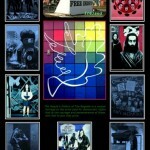 The Death of Innocence Mural was unveiled on September 1st 1999. This Mural is dedicated to the tragic death of Annette Mc Gavigan who was 14 years of age when she was shot and killed by a British soldier on September 6th 9171 when she was standing on the street where she lived. 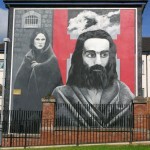 Hunger Strike, Raymond Mc Cartney Mural. 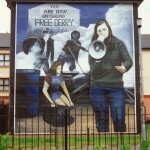 This Hunger Strike Mural was unveiled on July 25th 2000. This Mural was created to acknowledge the two major hunger strikes that occurred between 1980 and 1981, these hunger strikes which involved over 33 republican prisoners but the original seven were from the H-block of the Maze prison. The woman in the background remembers the 3 woman prisoners that also took part in the hunger strike from Armagh prison. 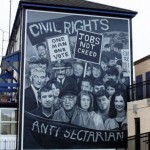 This Mural was painted in 1997 on the 25th Anniversary of the Bloody Sunday which took place in 1972. On the 30th of January 1972 the British Army opened fire killing 14 men, in this particular mural a group of men carrying the body of Jack Duddy from the scene of the shooting this group of men are led by then Father Daly now Bishop Daly, who here can be seen carrying a white handkerchief symbolising surrender.